The journey of selling and buying a home is harrowing, and it takes plenty of communication, negotiation, patience, intelligence and sometimes even a little luck. You’d never want to put up that “Sold” sign until the appraisal and inspection is done, for example, unless you want to jinx the sale. Take a look at some of the most popular real estate superstitions that you can use in your favor — and watch your step on this Friday the 13th. Don’t jinx yourself! Take a look at these 11 #realestate #supersitions. The home selling process can be stressful, and sometimes sellers need a little divine help to get the job done. Bury a statue of St. Joseph next to your “for sale” sign, and make sure his face is toward the street. As you cover him up, say a few prayers and wait for St. Joseph to do his work. Once your home is sold, dig him up and place him in your new home as a sign of gratitude. Looking to build a new home? Don’t choose a lot with an existing home on it. If you do, someone in your family will die an early death. In the U.S. we’re freaked out by the number 13, but in Chinese culture, the number 4 ain’t nothing to play with. The English pronunciation of the number sounds close to the pronunciation of the Chinese word for death. 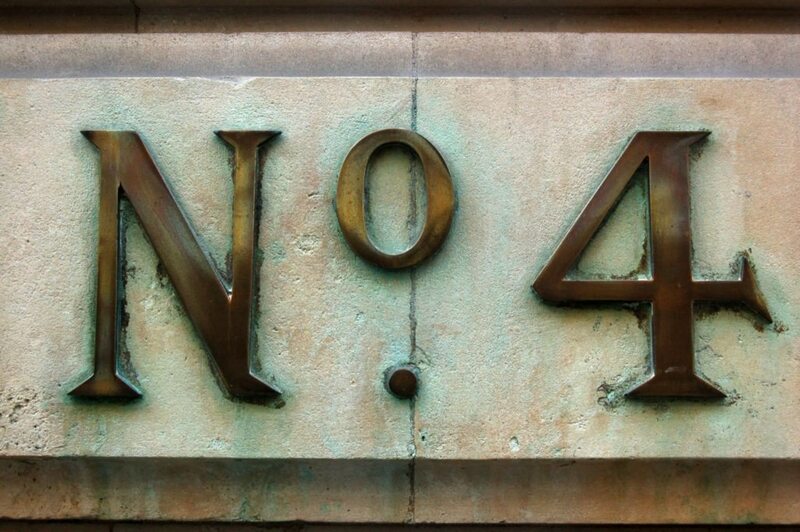 So, avoid house and street numbers with the number 4, and make sure it doesn’t pop up in the home’s sale price. During this time, people are more likely to make bad decisions and all of our fancy tech tools are bound to go haywire. Instead of your Zestimate being $10,000 off, it may be off by $20K. Eek! To keep Casper and his not-so-friendly other ghost friends away, paint the front of your home blue. Apparently, ghosts can’t tell the difference between a fresh coat of paint and a big body of water. Who knew? Want to break up with your bestie on the sly? Give them a set of knives for a housewarming gift. Your friendship will be “cut off” soon. On the other hand, bring bread, salt and rice if you want blessings to come to your new neighbor. Bread guarantees their pantries will always be full, rice guarantees prosperity and salt brings luxury. Just make sure they let you take a spin in their new Bentley. Put down your can of Raid, and roll out a red carpet (with a couple pieces of fruit) for the little critters that like to come in your home. In the Philippines, the presence of black ants mean a windfall is coming your way. Meanwhile, if you see an abundance of bees, keep an extinguisher around. Your house is bound to burn down. Sometimes Thor gets a little zealous with his thunderbolt games. To keep him from accidentally burning down your house with a wayward streak of lightening, place an acorn in your windowsill. Unfortunately, you may have to deal with a squad of squirrels trying to take them down. There’s only one place where it’s advantageous to money around — your home (You thought I was talking about somewhere else, huh?). When you move in, scatter coins across the floors to bring a ton of Benjamins your way. If the Wicked Witch of the West had gotten a new broom, she may have avoided being crushed by a house. Don’t bring your old brooms into your new home, as they can bring bad luck.